After doing my plethora of initiatives, evening came and we went out for Dustin's family birthday dinner, to Kobe...one of our family favorites. We started it when the kids were little because it was one of the places the always behaved because they would be so intrigued by the chef. It made for a very peaceful dinner. And it's still a great night out now, and one that always promises to entertain them. We took Steven with us. He hadn't been to Japanese since he was a little kid. He loved it. We had them come out and sing and bring a cake. Dustin was a little sheepish when they came out but I could tell he was enjoying himself. 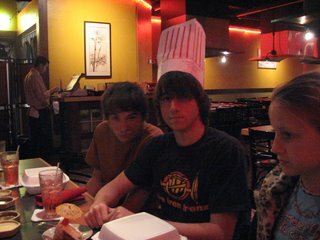 Here he is with the chef hat they gave him. Jordan still has his from last year's birthday.